McNeill graduated this past May from Texas Tech University with a bachelor’s degree in animal science. She rode for the Texas Tech Rodeo Team all four years. Her next step is graduate school in Oklahoma. She doesn’t intend to stop there. McNeill wants to get a PhD in ruminant nutrition as well. Growing up on a cattle operation sparked her interest for her future career path. McNeill keeps a string of horses for all the events she competes in. 2018 has been a great year for McNeill. She recently competed at the College National Finals Rodeo in Wyoming. 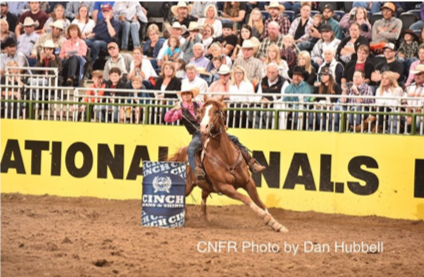 She put in the hard work with her new horse and was named the CNFR champion in barrels. Kimes Ranch Jeans have always been a favorite for McNeill. She is a big fan of the Lola, but has recently found another favorite. McNeill has a bright future ahead of her in the rodeo world. We are happy to have her on our team and wish her the best of luck on graduate school and the rest of the season.